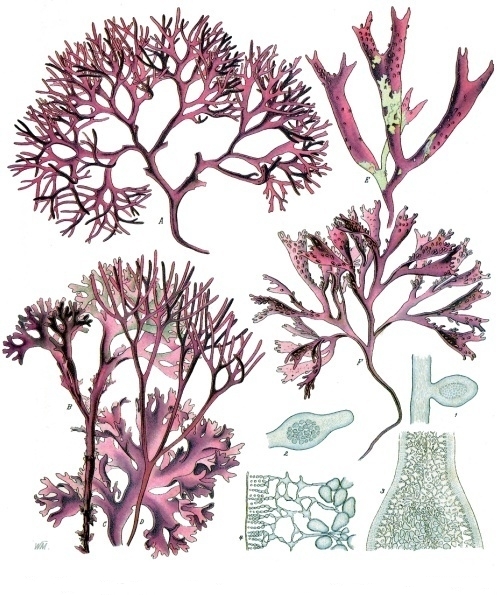 In nature, Irish Moss (Chondrus crispus) is a species in the red algae (rhodophyta) in the family Gigartinaceae, which grow abundantly along the rocky parts of the Atlantic sea coast. Irish Moss (Chondrus crispus) principal constituents are it's mucilaginous body, made of the polysaccharide carrageenan (carrageenin) of which it contains about 55%. Irish Moss also consists of nearly 10% protein and about 15% mineral matter, and is rich in iodine and sulfur.